The Greatest. The People's Champion. Cassius Clay. Muhammad Ali. He went by many names, but the outspoken boxer dominated the ring for decades, making the entire world take notice of his abilities and what he had to say. While his cardboard releases were very inconsistent over his career, collectors still have several notable Muhammad Ali cards to track down. Shop for Muhammad Ali Cards on eBay. 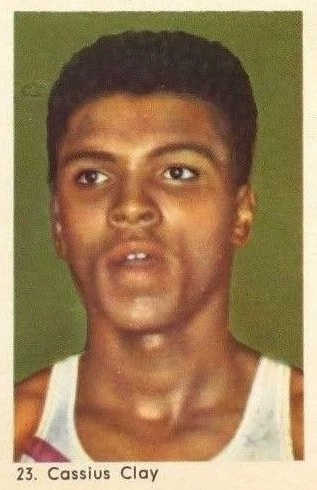 Although the earliest Muhammad Ali cards come from non-traditional sources, his professional debut was met with a variety of options issued throughout the 1960s. 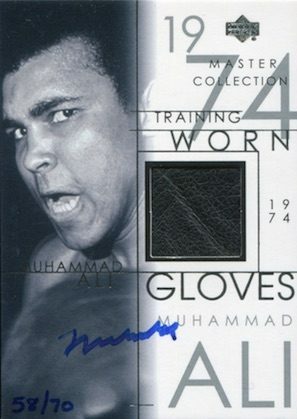 Many of these limited releases may not meet the true definition of a card, but still offer some of the first Muhammad Ali collectibles in existence. Infrequent inclusion over the years that followed, including his first mainstream cards, gave way to modern sets after Ali's retirements. This includes inserts and parallels as well as premium options like fighter-worn relic cards, autographs, and autograph relics. 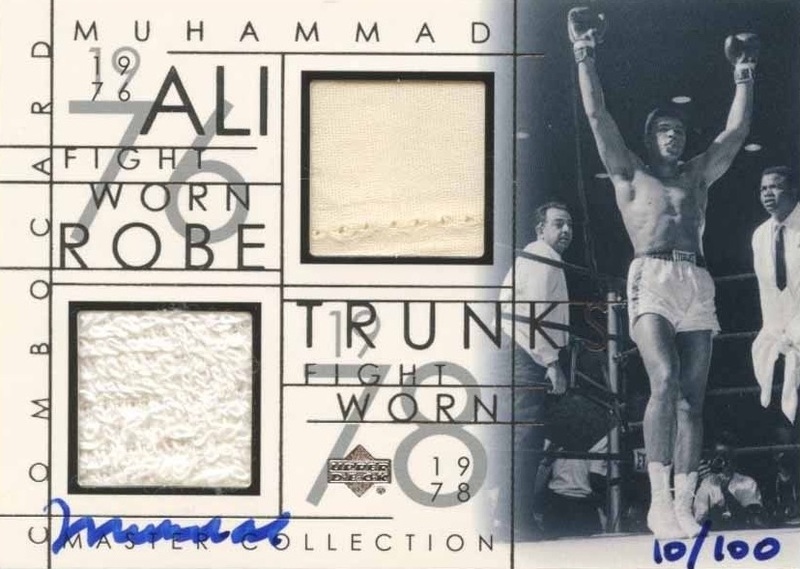 The list below aims to honor Muhammad Ali with a detailed overview of his key boxing cards, touching on several eras and price points along the way. 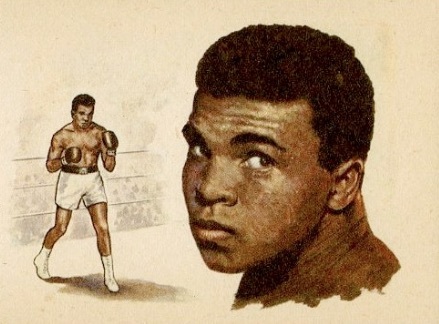 While Ali's cards are not as common as some may expect given his relevance and popularity, there are still many others out there beyond the cards that are covered here. 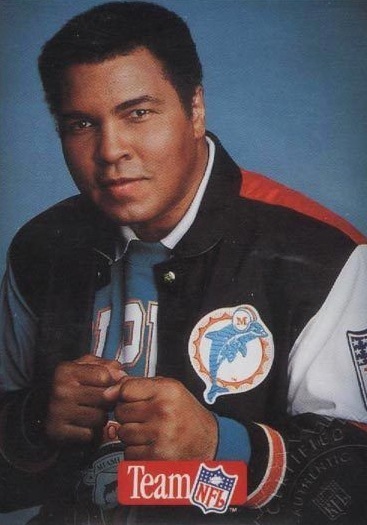 Let us know in the comments about any other Muhammad Ali cards that have a special place in your collection. Some of the earliest Ali collectibles definitely walk the line regarding the technical aspects collectors expect to see in their cards. 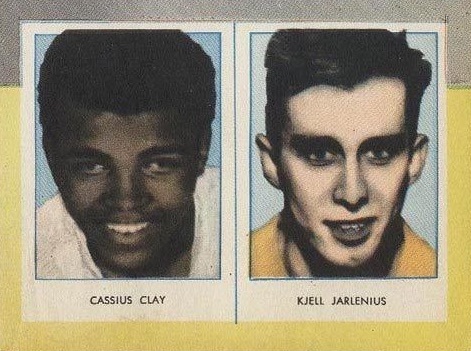 The 1960 Hemmets Journal featured a four-card panel with a young Cassius Clay joined by other athletes from the 1960 Rome Olympics. The panels came with punched holes for storing in a binder and were not intended to be hand-cut like so many ultimately were. This is especially evident as the backs do not line up exactly with the fronts. Sprinter Wilma Rudolph is also found on the same panel as Ali. Another Swedish option came in the 1962 Rekord Journal and shows Clay in a dual design alongside Kjell Jarlenius, a notable handball player in Sweden at the time. These are also hand-cut with many separating Clay individually. Issued in Spain, the bold look of the 1964 Simon Chocolates card immediately catches the eye. 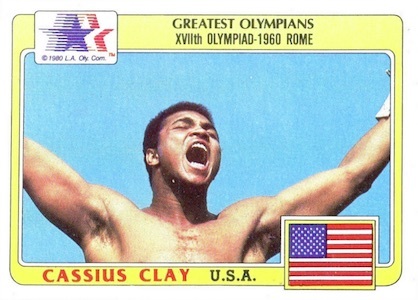 Likely celebrating a dominating win, the Cassius Clay card is more likely to appeal to pursuits as it was factory cut and part of a larger set. 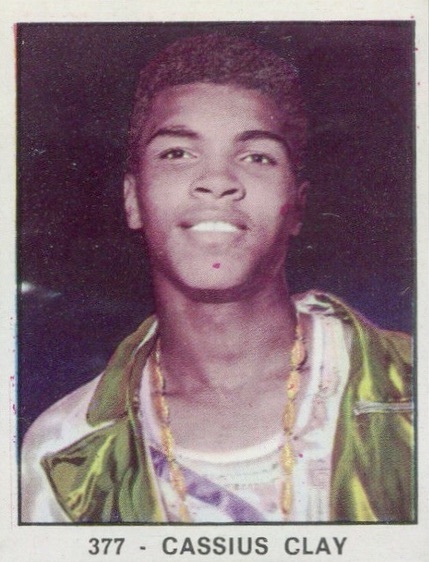 This is one of several to claim the title of Muhammad Ali rookie card. This dual-image card for Ali seemingly does so much with so little. Featuring a large image of Clay showcasing a determined stare alongside a smaller, in-ring drawing, the hand-cut 1965 Bancroft Tiddlers Giants of Sport card can be found in several variations that swap front-back pairings. One of the first to display the traditional card look, the 1965 Lampo features a bright blue background for Clay and a very relaxed image of The Champ. While these are already rare, card backs are the place to check for the even more scarce version that includes the vivid blue color as the text and a large "Vale Punti" headline. 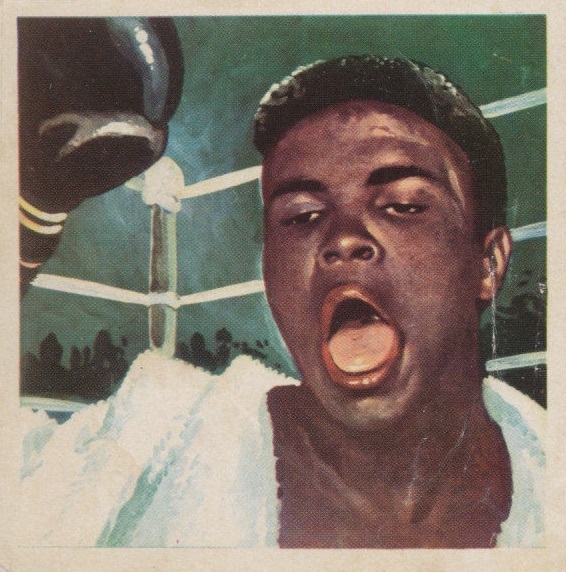 Incorporating the same image as the Lampo, modern giant Panini throws their hat into the vintage Muhammad Ali card ring with a simple 1966 release. 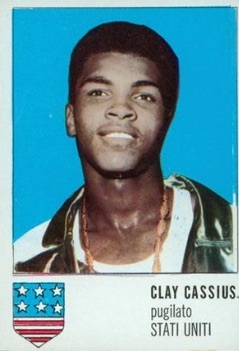 Not the easiest to locate, these are still some of the more common of the 1960s Cassius Clay cards out there. There are also more Panini cards for Clay released in subsequent years, including the 1967 edition (#451) below. 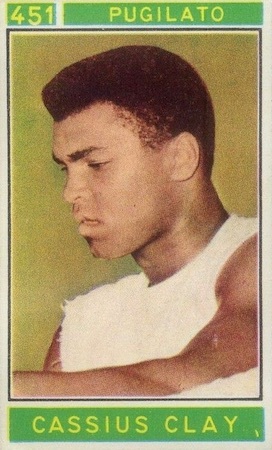 Listing him as "Cassius Clay or Muhamed Ali," the London-based Barratt & Co LTD produced a 50-card set of Goldflake Famous Sportsmen cards in 1971. 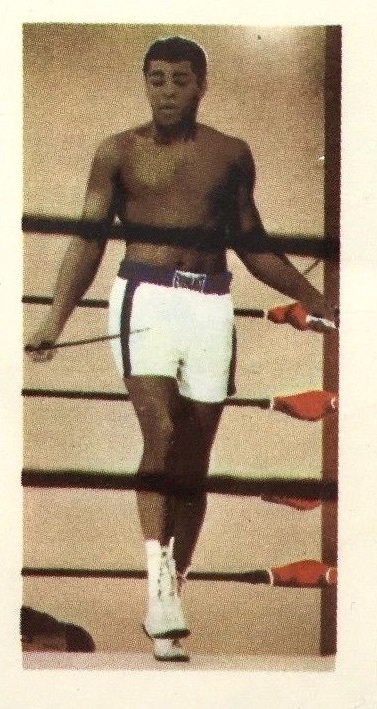 Featuring Ali in the ring, the image quality is not amazing but it is still notable as one of the first to reference his name change, even if the spelling was off. 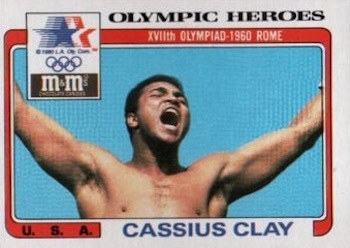 A truly captivating image of Cassius Clay, the 1983 Topps Greatest Olympians card honors his gold medal at the 1960 Olympics, noting him as "the self-proclaimed greatest" on the back. Affordable and common, this is the ideal place to look for those collectors on a limited budget. There is also an M&M Olympic Heroes version (#7) with a very similar design. 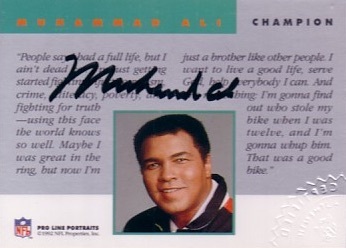 Part of a multi-sport set that had a print run of 295,000 copies, the 1992 Classic World Class Athletes release also included one of the first signed cards for Muhammad Ali. 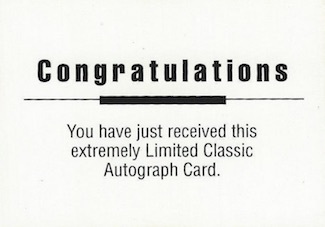 Found in a few variations, including a base autograph, one hand-numbered to 2,500 or with an added "1964 KO" inscription (#/250), authentic signatures also feature a "Congratulations" back that is different than the standard back on the unsigned card. Admittedly not the most impressive option given the NFL affiliation and the fact that he signed on the back of the card, the 1992 Pro Line Portraits Autograph for Ali still holds significance as a very early signed option. The main thing that designates the Portraits card as authentic is the embossed stamp in the corner. The other difference between the signed and unsigned base card is that the base lists "Team NFL 1" on the card back while the signed card does not have any card number. Still, as forgeries are an issue, collectors should be careful when making purchases. 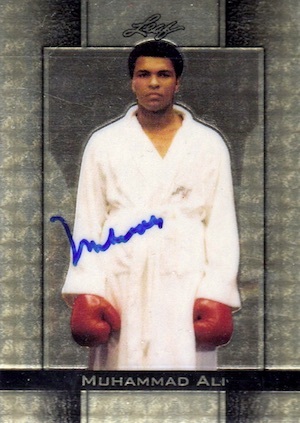 Collectors should also know that he provided both Muhammad Ali and Cassius Clay signatures for the set. 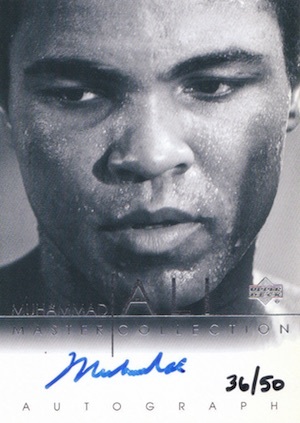 Without question, 2000 UD Muhammad Ali Master Collection is the pinnacle of Ali autographs. The high-end factory set brought collectors a mix of choices, including autographs, relics, and autographs relics. All feature on-card signatures and hand-numbered print runs. The entire run is limited to 250 sets that are presented in a custom wooden case. Although tougher to find unopened, each sealed set promised one autograph, three relics and a mystery pack with either a one-of-one base parallel or an autographed relic for Ali. 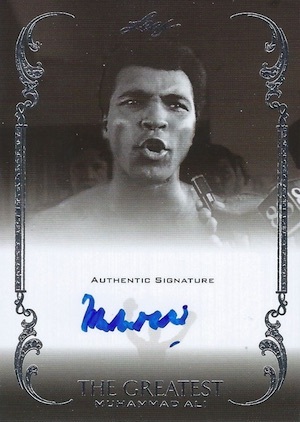 Leaf has been the most frequent issuer of Muhammed Ali cards and sets in the last few years, and that includes several different autographs for Ali. While the overall signature quality is noticeably different than his earlier autographs, it does offer collectors more signed options and is still worth highlighting. 1966 Panini CARD Cassius Clay Campioni Dello Sport #377 Very Rare Used Good !! CASSIUS CLAY #282 STICKERS - VERY RARE - YEAR? 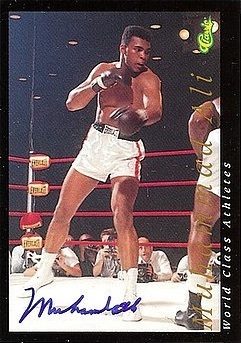 On ebay they got 1992 classic muhammad ali auto cards limited print run of #/300. Are these cards legit even if they got “Congratulations” written on the back?